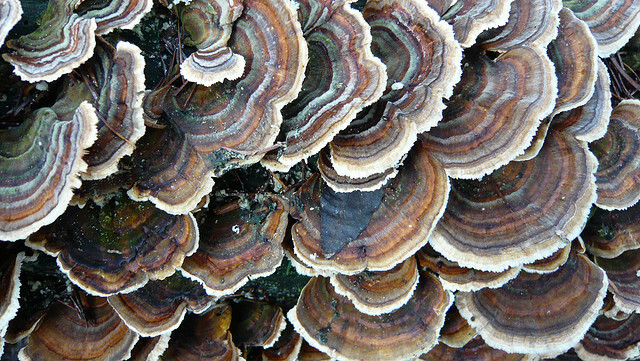 Big headlines: A polysaccharide from the turkey tails (Trametes versicolor) mushroom prevented 100% of prostate tumors. Great news. And turkey tails is a great mushroom as you can see below in the piece I wrote back in 2005. At that point, a different polysaccharide had already shown 100% effectiveness in women with a certain type of breast cancer. This latest study, although interesting, is not as enlightening as the earlier studies. It simply revealed how PSP (one of turkey tails’ polysaccharides) affected a small handful of mice over a few weeks. First, 200 mg/kg/day PSP for 4 weeks did not prevent prostate cancer in 5 mice. But, 300 mg/kg/day PSP for 20 weeks did prevent prostate cancers from forming in 5 other mice. For a man weighing 160 pounds the equivalent dose would be 22.5 grams per day, a huge amount. Other studies have already shown that a different sugar from this mushroom,PSK, has a very positive effect in cancer in humans. So, I would not necessarily run out and buy PSP based on this mouse study. Mushrooms and their sugars (polysaccharides) show great promise in cancer treatment. In Japan, MDs have long used a turkey tails (mushroom extract as part of their standard cancer treatment. But despite decades of use in Asia, mushroom extracts are largely unknown in the U.S.
A Japanese engineer developed a method of extracting one of turkey tail’s sugars (know as PSK or Krestin) after watching a friend go into cancer remission after taking the whole mushroom. His extract proved non-toxic and in the 30 plus years it has been in use, its only side effect is an occasional darkening of the fingernails. PSK was first tested in patients with advanced stomach cancer. They were given PSK and chemotherapy (immunochemotherapy) after surgery to remove the tumor. PSK more than doubled the number of patients alive two years later compared to patients treated with surgery alone. Larger studies showed that adding PSK to the chemotherapy doubled the 5 year survival rate in patients with advanced, metastastic stomach cancer. It also significantly increased 15 year survival. Today, the standard Japanese protocol for stomach cancer includes the use of PSK before, during, and after surgery combined with post-surgical chemotherapy. Studies on the use of PSK in colorectal cancer followed. PSK, again combined with chemotherapy, increased the 3 year survival from 40 to 74%. Although the treatment did not cure, it prolonged survival, prevented recurrence, and improved quality of life compared to chemo alone. Similar benefits have been shown in esophageal and nasopharyngeal cancer. In breast cancer, the results are more varied. However, in patients with a HLA-B40 positive type of breast cancer, the combination resulted in a 100% survival at 10 years. Today, Japanese researchers are working to learn how PSK works and determine which cancer patients will benefit most from its use. It appears that PSK helps patients regain a healthy immune system in cancer and maintain it during conventional cancer treatments. In health, specific types of immune cells mount the defense against cancer. However, if cancer cells evade detection and grow, they secrete compounds that prevent the body from producing cancer-fighting types of immune cells. Other events also trigger a similar immune imbalance, such as exposure to heavy metals and other toxins. Surgery causes a brief period of immune suppression and may prevent the cancer patient’s immune system from destroying residual tumor cells. Japanese physicians prescribe PSK prior to cancer surgery to help prevent metastasis and recurrence by supporting the patient’s immune system. PSK also shows many benefits in the test tube. It appears to prevent metastasis by inhibiting cancer cells that have migrated to new locations from attaching and growing new blood vessels (angiogenesis) needed for cancer growth. Frustratingly, there are no studies comparing whole turkey tails mushroom with PSK – even though PSK’s discovery was triggered by a man using the whole mushroom as a cure. Chinese physicians use a different sugar from turkey tails mushroom, PSP, which also shows benefit in cancer. It is possible that the whole mushroom will have a greater effect on the immune system than PSK or PSK alone. It is also possible that PSK or PSP provide a more effective dose than the whole mushroom. Yet more frustrating is that fact that US physicians are not telling their cancer patients about the research showing that PSK, PSP or turkey tails might improve their responses to cancer, chemo, radiation, and surgery. Fortunately, patients are able to get turkey tail mushrooms. Host Defense Turkey Tails a product made by Fungi Perfecti provides whole turkey tails as does Liver Force®, a product made by New Chapter. In addition, it is also possible to special order the isolated PSK and PSP extracts used in Japan and China off the internet. This entry was posted in Uncategorized and tagged breast cancer, Coriolus, prostate cancer, PSK, PSP, Trametes, turkey tails. Bookmark the permalink.